Tangipahoa and St. Helena are two of the eight Florida Parishes in southeast Louisiana. In 1810, St. Helena Parish was founded, and Tangipahoa Parish followed in 1869. The historic St. Helena Parish, Louisiana, public school desegregation case predated the US Supreme Court decision in Brown v. Board of Education of Topeka, Kansas. Many families in the two parishes are the descendants of former slaves. They endured the harsh treatment of Jim Crow and segregation while remaining connected to the Florida Parishes. Notable Grammy-winning singer Irma Thomas and Collis Temple Jr., the first African American to play varsity basketball at Louisiana State University, call these parishes home. Many African Americans in the parishes are successful and are still working to improve race relations. 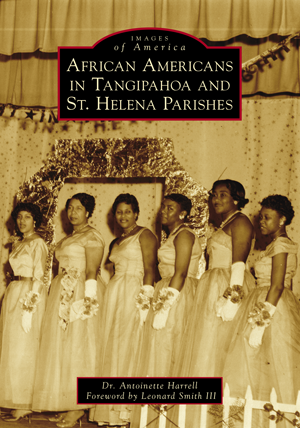 Dr. Antoinette Harrell is a renowned genealogist and local historian of the two parishes. She is an author and the producer and host of the Nurturing Our Roots Genealogy television talk show. Her research on the subjects of peonage and involuntary servitude has been featured in many media publications. She is committed to preserving the oral histories and images of African American culture in St. Helena and Tangipahoa Parishes, Louisiana.